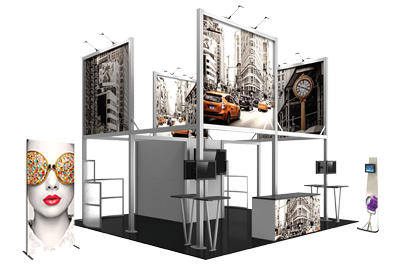 The Formulate® Master Backwall 2ft Height Extension Hardware makes it simple to convert an existing 8ft tall backwall into a stunning 10ft tall display. Compatible with 8ft, 10ft and 20ft wide Horizontal Curved and Straight units, 2ft tall aluminum tubes with snap-button connectors easily attach to existing frames. High-quality 10ft tall pillowcase fabric graphics are sold separately. Add height and additional space for messaging with 2ft Height Extension Hardware!